Spirit Magazine Jan 2012 (the in-flight magazine of SouthWest airline), Tell Me Something, featuring benefits of family dinner. Scroll down for section: Is there a Simple Way to Keep My Family Happy and Healthy? 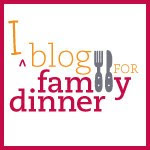 Why Family Dinner, Grace R. Freedman, 06.22.11, re-published as guest post on Timi Gustafson's Food & Health.